Hi Simmers! 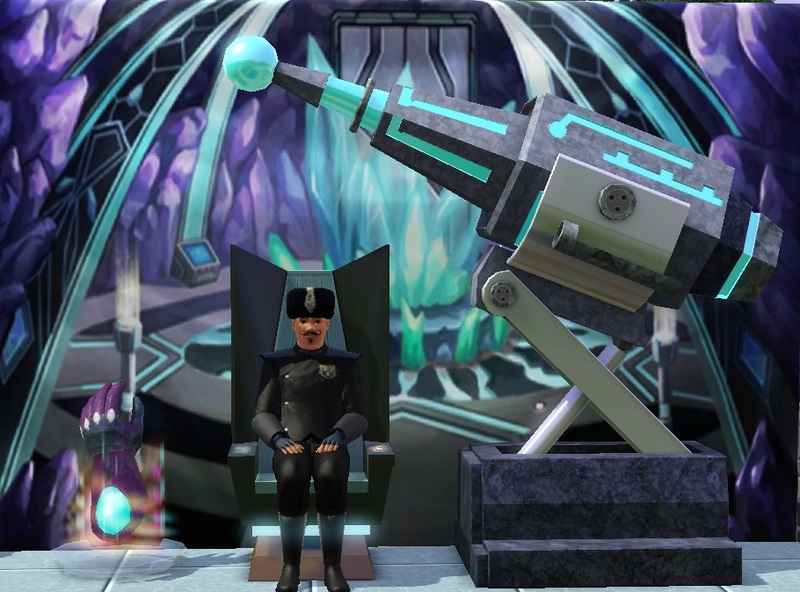 SimGuruSarah here to tell you a little bit about our newest Stuff Pack: The Sims 3 Movie Stuff! This pack features dozens of objects and clothing inspired by three classic movie genres – Western, Horror and Heroes & Villains. The Western content was inspired by the classic “Spaghetti Western” movies of the 1960’s. We wanted to do something fun that was not necessarily historical. We settled on a saloon theme and created objects to tell a story in that setting. 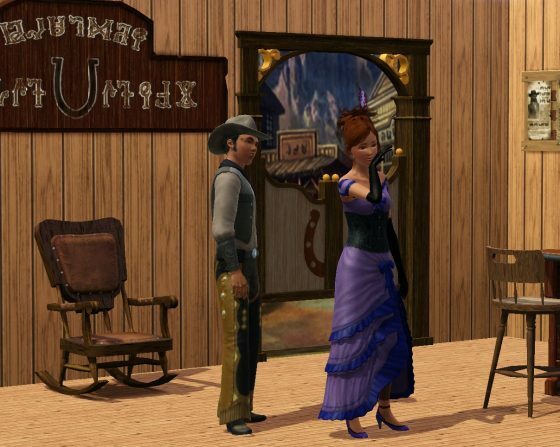 We have a new bar with a matching barstool, a dresser vanity, a rocking chair, a saloon door, and several new wall pieces (one of which has an Easter egg…Bella! Tell me if you find her when Movie Stuff comes out ;-)) Oh, and we have an All-In-One-Bathroom Outhouse! I absolutely love the new Western attire which features hair, shoes, and clothing for both genders, as well as a new mustache for the men. For female adults, we have a top and bottom set for a sheriff (with pants or a skirt option) and three full body dresses, including a classic saloon girl which shows off a lot of leg! For men we have a classic cowboy look with chaps and leather vest and a ten-gallon hat. The second movie genre we chose for The Sims 3 Movie Stuff is “spooky horror.” This was both fun and challenging because we wanted to create clothing and objects that felt distinctly different from what you would find in The Sims 3 Supernatural. We settled on a mix of classic horror and quirky Gothic style. We have a tragic bride in her worn wedding dress and veil, and a leather outfit with straps and buckles (with matching shoes) for the ladies. All of the artists working on The Sims 3 Movie Stuff are comic book junkies, so the hero & villain content was definitely our favorite genre to brainstorm and develop concept art for! We thought about all of our favorite heroes (and villains!) and then we put a Sims spin on it. We came up with unique creations such as Freezer Bunny Man, Super Justice Llama, and the villainous General Skunk! There is even a sidekick outfit for the kids! There are some really unique objects you can use to build out your hero or villain’s lair. We have a new table that is a crime map of the city that has flashing lights to indicate where crime is occurring. There is an awesome new wardrobe with superhero logos on the front, and a dresser vanity that has lots of lights, knobs, and other high tech looking gadgets. One of my favorite new objects is the Laser Door! Lasers turn on and off as your Sim walks through the door, and you can change the colors of the lasers. Oh, and did I mention the phone booth that doubles as a shower? What kind of stories will you create with all these objects? We’ll wait and see when The Sims 3 Movie Stuff Pack comes out! Look for it on September 10 in North America, and September 12 and 13 in Europe and APAC. We have a special behind-the-scenes set available only to those fans who buy The Sims 3 Movie Stuff through Origin. Stay tuned for more fun stuff we’ll share from this pack! Wow, dit is het eerste SP waar ik zowaar enthousiast van word! Zit er eigenlijk ook nieuwe gameplay in, of is het echt alleen spullen?